On Dec. 12 at the August Wilson Cultural Center (AWCC) in Pittsburgh, Pa., trumpeter/composer/educator Sean Jones will present the world premiere of his composition A Suite for Flying Girls. The piece, commissioned by the AWCC, was inspired by the installation Flying Girls by Nigerian artist Peju Alatise, which was first shown in the 2016 Venice Biennale and is currently on display at the AWCC through Mar. 24 as part of a group exhibition called Familiar Boundaries. Infinite Possibilities. For tickets and more information about A Suite for Flying Girls, the Familiar Boundaries. Infinite Possibilities exhibition, and the Dec. 12 concert, visit the AWCC’s website. 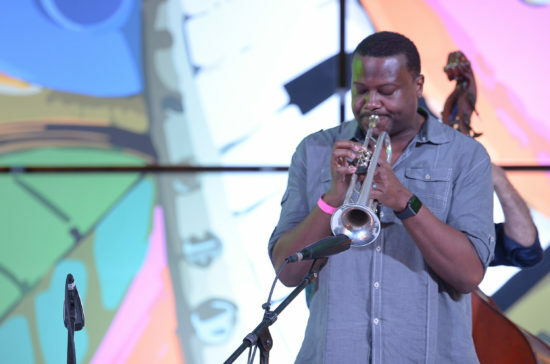 Read a 2014 JazzTimes feature article on Sean Jones.